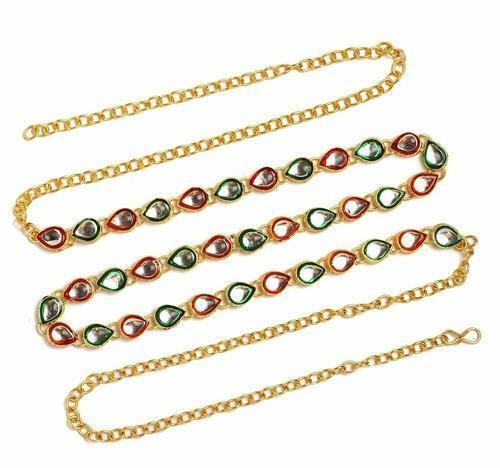 Pioneers in the industry, we offer Waist Belt / Kamar Band, Waist Belt Gold Plated Belly Chain and Bindhani Antique Mehandi Plating White Stone Belly Chain from India. Elegantly designed and crafted from alloy, it will not only give your look a mesmerising accent, but will also garner you with compliments from one and all. This waist belt of golden tone with encrusted kundan in it looking flawless because of enamel boundary in red and green colour. Size is adjustable with S shaped hook and extra chain can be easily removed. Charming is what you will look at the next wedding gala flaunting this Gold coloured kamar bandh from Bindhani Add-Ons with the most gorgeous of your attire. Elegantly designed and crafted from alloy, it will not only give your look a mesmerising accent, but will also garner you compliments from one and all. A antique mehandi plating belly chain, light weight, white stones studded in mehandi plating which shine for long lasting.